Kominimung and Romkun, Most of them speak different languages. There is no institutionalized traditional organisation above village level. had roofs extended to the gound but today family houses are built on posts. 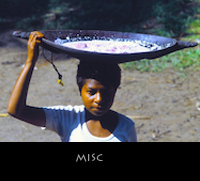 Sago and fish provide the staple food for the people of the Ramu Lowlands. Also yam, taro, sugar cane, greens, and bananas are grown in the gardens. Occasionally wild pigs and crocodiles are hunted and speared. 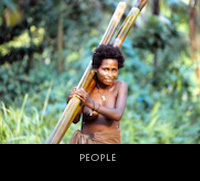 The religious activities of the Ramu people were centered around the belief in ancestral spirits. 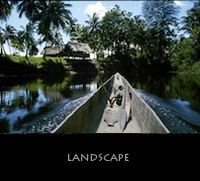 The Ramu area is one of the most culturally diverse regions of Papua New Guinea. Its exciting visual art, particularly woodcarving, is internationally renown. The centre of every village was the men's ceremonial house or Haus Tambaran as it is called in pidgin. flowers, leaves and shell ornaments. Such mask costumes are worn by initiated men representing mythical ancestors in the yam harvest ceremonies. 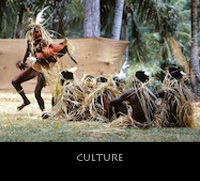 In ceremonies and dances men and women wear a great variety of body ornaments made of shell, dog teeth and pig tusks.